Republic Day marks India's adoption of a republic constitution (with a president rather than a monarch) on January 26, 1950, after gaining of independence from British rule in 1947. Understandably, this makes it an occasion that's close to the hearts of all Indians. Republic Day is one of three national holidays in India. The other two are Independence Day (August 15) and Mahatma Gandhi's Birthday (October 2). How Did India Become a Republic? India fought a long and hard battle for freedom from the British empire. Known as the Indian Independence Movement, the battle spanned 90 years, starting from the large-scale Indian Rebellion of 1857 against the British East India Company in the northern and central parts of the country. During the later decades of the movement, Mahatma Gandhi (who is affectionately referred to as the "Father of a Nation") led a successful strategy of non-violent protests and withdrawal of cooperation against British authority. In addition to many deaths and imprisonments, independence came at a price -- the 1947 Partition of India, in which the country was split along the line of religious majorities and Muslim-dominated Pakistan came into being. It was deemed necessary by the British due to growing conflicts between Hindus and Muslims, and the need for a unified secular democratic republic. 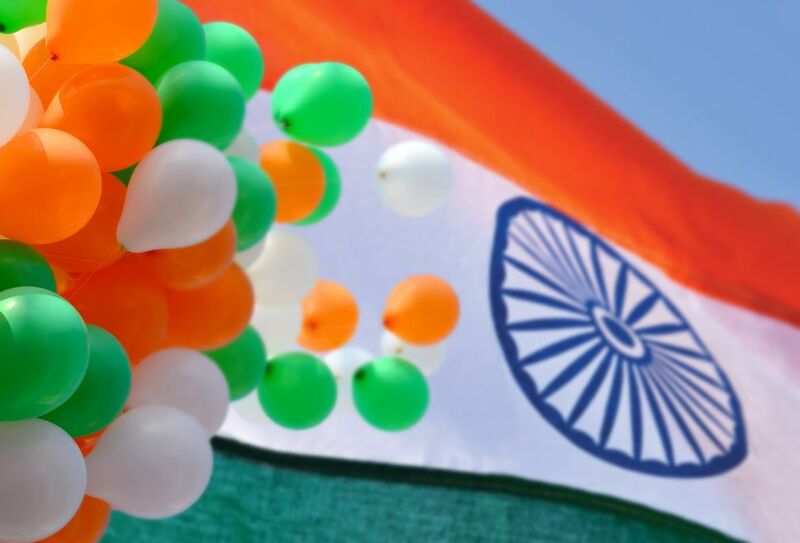 What's important to note is that although India officially gained independence from the British on August 15, 1947, it still wasn't entirely free of them. The country remained a constitutional monarchy under King George VI, who was represented by Lord Mountbatten as the Governor General of India. Lord Mountbatten appointed Jawaharlal Nehru to be the first Prime Minister of independent India. In order to move forward as a republic, India needed to draft and implement its own Constitution as the governing document. The work was headed by Doctor Babasaheb Ambedkar, and the first draft was completed on November 4, 1947. It took almost three years for the Constituent Assembly to finally ratify it though. This occurred on November 26, 1949, but the Assembly waited till January 26, 1950, to put the new Constitution of India into effect. Why was January 26 chosen? During India's struggle for freedom, the Indian National Congress party voted for total independence from British rule, and this declaration was formally made on January 26, 1930. Celebrations take place on a grand scale in Delhi, India's capital city. Traditionally, the highlight is the Republic Day Parade. It features contingents and displays from the Army, Navy, and Air Force. The parade also includes colorful floats from each of India's states. Smaller Republic Day parades are held in each state as well. The second most impressive show of military might (after Delhi) can be seen in Kolkata, West Bengal. An extensive military parade takes place along the historic Red Road in front of Fort William in Kolkata's Maidan, starting with a traditional military fly-past. It includes various marching contingents from the armed forces, display of weapons, military bands, and floats from various military departments. The ceremonial parade at Marina Beach in Chennai, Tamil Nadu, commences with the hoisting of the Indian national flag near the statue of Mahatma Gandhi. It's followed by a march of contingents of the armed forces, paramilitary personnel, state police personnel, and various school bands. Plus, a display of various government department floats. Local students also perform in cultural events. There's a parade and cultural fair at Field Marshal Manekshaw Parade GrounGoad on M.G. Road in Bangalore, Karnataka. In Mumbai, in Maharashtra, a Republic Day celebration is organized by the state government at Shivaji Park in Dadar and features a parade of the police force. Indians love a good party, so many people and housing societies organize individual Republic Day celebrations. These often consist of fairs and talent contests. Patriotic songs are played through loudspeakers all day. The Republic Day Parade in Delhi is followed up with a Beating the Retreat ceremony on January 29. It features performances by bands of the three wings of the Indian military -- the Army, Navy and Air Force. This type of military ceremony originated in England and was conceived in India in 1961 to honor the visit of Queen Elizabeth II and Prince Phillip for the first time after Independence. Since then, it has become an annual event with the President of India as chief guest. In 2015, US President Barack Obama became the first US President to be the chief guest at Republic Day. The invitation reflected closer relations between India and the US and an era of "new trust" between the two countries. The crown prince of Abu Dhabi, Sheikh Mohammed bin Zayed, was the chief guest at Republic Day celebrations in 2017. Although he may seem like an odd choice, there were a number of underlying reasons for the invitation such as infrastructure investment, trade, geopolitics, and deepening of relations with the United Arab Emirates to help thwart terrorism from Pakistan. In 2018, the leaders of all 10 Association of Southeast Asian Nations (ASEAN) countries were chief guests at the Republic Day Parade. This included Indonesia, Malaysia, Philippines, Singapore, Thailand, Brunei, Cambodia, Laos, Myanmar and Vietnam. It was the first time that so many heads of government and state attended the parade together. In addition, there have only been two Republic Day parades in the past (in 1968 and 1974) that have had more than one chief guest. ASEAN is central to India's Act East Policy, and both Singapore and Vietnam are important pillars of it. Donald Trump, the President of the United States, was invited to be the Chief Guest in 2019. However, he declined due to other engagements. South African president Cyril Ramaphosa will be the Chief Guest instead. He is a follower of Mahatma Gandhi and Nelson Mandela, which is significant because Gandhi was born 150 years ago this year. MESCO (Maharashtra Ex-Servicemen Corporation Limited) offers a special tour to see the Republic Day Parade and Beating the Retreat ceremony accompanied by ex-servicemen of the defense forces. You'll also get to visit some of Delhi's top attractions and the Taj Mahal on the tour. The cost is 21,500 rupees per person. The revenue generated from the tour is used to look after the welfare of ex-servicemen, war widows, physically disabled soldiers, and their dependents. Doctor Rajendra Prasad was elected as the first President of India on Republic Day in 1950, replacing the Governor General of India as head of state. When India became a republic, it was the first country within the Commonwealth of Nations to do so. Jana Gana Mana became India's national anthem on Republic Day in 1950. The national flag had already been adopted, on July 22, 1947. Those who'd like to have an alcoholic toast to celebrate Republic Day should note that it's a dry day across India. This means that shops and bars, except for those in five-star hotels, won't be selling alcohol. It's usually still readily available in Goa though.